County Map of North Carolina, South Carolina, Georgia and Florida. 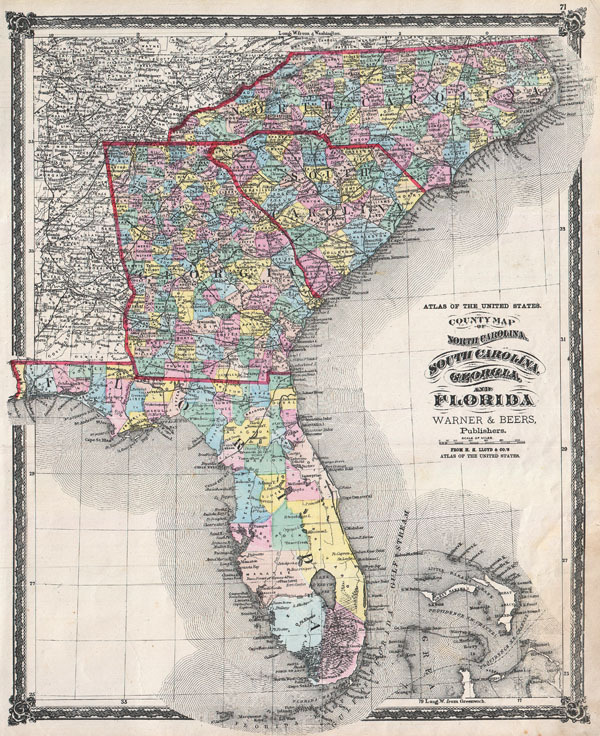 An attractive hand colored 1874 map of the southeastern part of the United States by Warner and Beers. Includes the states of North Carolina, South Carolina, Georgia and Florida. Also includes part of the Bahamas. Detailed to the county level with roads, railroads, towns, forts, and geographical features noted. Surrounded by decorative border. Published in by Warner and Beers in 1874 as plate no. 71 in H.H. Lloyd's Atlas of the United States. Very good conditon. Minor discoloration in lower right quadrant. University of North Carolina at Chapel Hill , Cm912 1872w. OCLC 52193267.